HAS REALITY DAWNED FOR YOU? 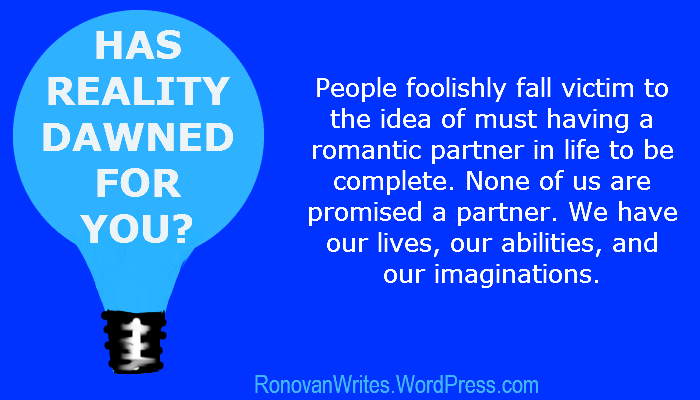 Today may be a message you want to skip here on Ronovan Writes. It won’t be a pretty message. This is almost a rant but not really. It’s more of a self-realization and determination I’ve discovered as I witness actions in others. Now, don’t think that any of this is judging or anything like that. I’m speaking to this based on a personal level. But it’s something that almost hit me between the eyes with a clarity I’ve never seen before about the subject. We are all alone at some point. We feel as though no one loves us and we wonder why it is even worth attempting love. I’ve been there. My journals are filled with it. FILLED! I know the heavy feeling of the body when you are so low and your heart literally aches. If you’ve never felt heart ache, you’ve never been truly and desperately in need of love or been so broken because of it. Your body, your chest, your heart feels as though it is being squeezed and trying to expand out of your chest at the same time. A mournful soul wailing in the night from some distant bedroom behind darkened windows takes on a meaning to you when reading it in a book like never before. Tears come to your eyes and you feel as though you’ve read the most beautiful thing in life. And every moment you feel alone. There is no love for you. There is no caring, no warmth. No tender and loving touch. The next morning you get up and hurriedly get yourself ready for the day, so you can then get your children ready for school. You barely make it through your day, putting on fake smiles and pretend laughs only to arrive home to begin your ritual of loneliness again, once the children have gone to do their own things in their rooms. This goes on for years. And then one day a reality dawns. Now for me a reality dawned. I am fortunate in many ways. You all know of my boy “B”. But you also know of my blog, my writing, my LitWorldInterviews site, and even my debut novel coming out. I have great friends that came together in my time of need for a laptop to keep my sanity and my lifeline going to all of you. The dawning to me didn’t occur until now. It didn’t have to. It just happened. Maybe you’ve picked up on what the dawning is. But for others they don’t realize what they have. People go through those feelings described above every day, wanting someone. For some they have children and never give a thought that they are loved, they have those people to love them, to have fun with, to enjoy life with. People foolishly fall victim to the idea of must having a romantic partner in life to be complete. None of us are promised a partner. We have our lives, our abilities, and our imaginations. To be happy in regards to companionship we have those around us; our family, our friends, and if we are in a situation of no longer having a partner or in that all too commonality of emotionally detached partner, then we may have children. Love those children and enjoy them. Do not be selfish and deny them your 100% enjoyment. We don’t realize how aware children are these days. They notice everything because they are shown everything in so many forms. They know what facial expressions, body language, and even excuses really mean. We can do a great deal of damage to our children by living and dwelling in a personal emotional space of constant want. We are the role models for our children, or we hope we are. Look at who and what you are, the space your mind is in and ask yourself if you want your child to be like that? Yes, I know there are some with true concerns that need help, professional help, but I think most of you realize I am speaking about the rest of us who can overcome these moments and situations on our own. You don’t need a romantic partner. That’s a myth. A very nice myth. A romance that happens is something for people who are in them. That does not mean they are in a situation that is better than a person who is not in a romance. You could probably ask a lot of people who are single again and they will tell you that they enjoy the single life a lot more. Some might say romance is better. Love your kids, your friends, and your family. Don’t worry about romance. If it is meant to be and it happens, then that is a situation you will discover you either enjoy or not. A romance is a lot of work in order to make it a strong and lasting one. Even those that seem perfect to everyone else, they need a lot of behind the scenes work. If you are someone waiting on someone else, even a specific someone, and that someone doesn’t seem to be waiting for you . . . think hard about enjoying what you do have. Sometimes what you have is the most precious thing you could ever have. Learn to smile and to love in you.